Correct answer: c) Once every five years. 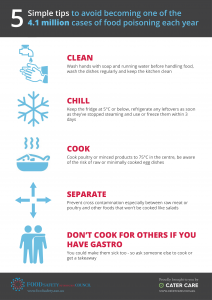 A study published in 2014 by the Australian National University found that there are an estimated 4.1 million cases of food poisoning each year which gives you an average chance of getting food poisoning once every five years. This is about the same as other developed countries such as the US, Canada or the UK. Modern fridges can cope with warmer food being put in them so divide the cooked leftovers into smaller portions that will cool down quicker and refrigerate or freeze as soon as the food has stopped steaming. Like beef or lamb, you can safely serve whole pieces of pork rare safely in Australia as the type of parasites (e.g. Trichinella) that may be a concern in pig meat overseas are not present in Australia’s commercial pig population. Minced pork products or rolled and/or stuffed cuts such as roasts and schnitzels must be cooked to 75°C at the centre. 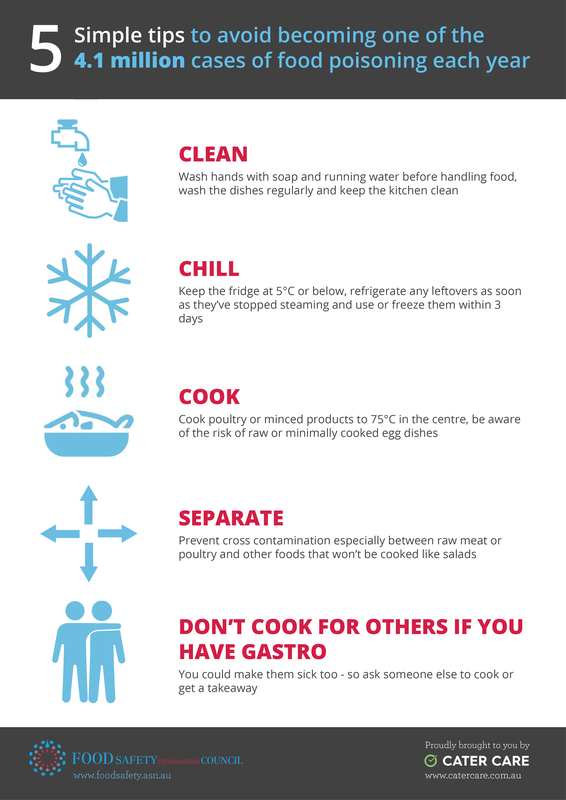 Everyone blames their food poisoning on the last meal they ate but some forms of food poisoning can take days or even weeks to eventuate. This is what makes it very difficult sometimes for health professionals to find what causes food poisoning. While vomiting and diarrhea are the most common symptoms, food poisoning in extreme forms can cause many symptoms including all of those above. Each year food poisoning results in 31,920 hospitalisations, 86 deaths and 1 million visits to doctors. A thermometer is the only way to know your food is cooked correctly to an internal 75°C. Seafood in Australia is very safe but can be a culprit due to toxins. OzFoodNet has determined that poultry is the primary source of Campylobacter outbreaks in Australia and the increase in Salmonella infections in recent years are linked to raw or minimally cooked egg dishes. Most people don’t recognize seed sprouts as a risk- a 2005 Salmonella outbreak in WA of 125 cases and a 2006 Salmonella outbreak of 15 cases in Victoria were both linked to alfalfa sprouts. Most people are surprised that cooked rice is a food poisoning risk. Once it is cooked and begins to cool then toxins can be formed by Bacillus cereus. This bacterium can form heat resistant spores and a heat resistant toxin. If cooked food is allowed to cool slowly the spores can germinate and reheating or lightly cooking the food will not destroy this toxin. Pasteurisation (heat treatment for a short period to kill harmful bacteria) has done a great deal to reduce food borne disease over the years. It is illegal to sell unpasteurised (raw) cow’s milk in Australia for human consumption and health authorities recommend that it should not be consumed. No matter how carefully the animals are milked there is always a risk of harmful bacterial being present. Consuming raw milk can cause severe illness due to the possible presence of harmful bacteria such as Shiga Toxin–Producing Escherichia coli, Campylobacter and Salmonella. Pregnant women, young children (particularly babies), the elderly, and people with weakened immune systems are at greatest risk of getting sick and the consequences for them can be more severe. Pasteurised milk is as nutritious as unpasteurised milk.